What are the most important factors you use when you set up a poor man’s covered call trade? Is it the same as regular covered call writing? If you want more “Ask Alan” videos, you can! Become a premium member today, and tune in to the educational power of the complete library! I decided long ago, I’m soon to be 77, that I would only trade in tax qualified accounts. My journal of trades, which has 11 tabs, sometimes seems too time consuming and I am looking at ways of automating that. I am sure it is not as bad now as it was in the early years of spreadsheets. My tax returns are getting more simple as I continue to run out of tax loss carry forwards, some of which I will never be able to use as I will never had that kind of specific income again. Maybe some day the tax laws will tax all trading at a low flat rate so you can just file that you made or lost X dollars and you either pay a tax or have a loss that can offset any income. Anyway, thanks for all your work on behalf of others. My hat is off to you and Mario – as well as Roni and others – who add so much to this blog. It really should be, and is, more than the “Ask Alan” quiz show :). Members should talk about what they do and what works for them – just as you guys do! Gosh, I am with you on the tax stuff. I have level three options clearance in my trading IRA. I can sell inverted condor lizard butterfly strangles diagonally if I want :). Yet I can’t imagine the tax complexities of selling options in a cash account!? Most brokerages have four levels of option trading clearances. A few have five levels. Your and my level three would be the same as level four with those who have five levels. My trading accounts are at Etrade. $4.95 per trade; plus $0.50 per contract on options. There cheaper ones out there but I have been here through their predecessor companies since the 80s when I traded with PCFN thru Prodigy on a dial up modem. My cash account is at Vanguard in 8 funds. This combination of funds typically beat the S&P 500 by about 2%. While not an IRA the account works like an IRA except for my share of fund capital gains and that is not significant as they are very tax efficient in their selling. I haven’t taken money out of my cash account in years as it doesn’t have a RMD requirement. Just no trading. Oh BTW, Jay, I have been aiming to ask you for months. In your life in NO did you ever come across a Jerome Davis? Jerry, as we call him, was a high school classmate of mine. Jerry retired from the Coast Guard as a Commander. Later went work for the city of NO and was in charge of the city employees pension fund. In that position he sued J. P. Morgan and won a large settlement for the fund. Jerry is the most knowledgeable bond guy I ever met. He is brilliant. His bond spreadsheet is way over my head. Just wondered if your paths had ever crossed. No, I have not crossed paths with Jerry though he sounds like a fun and interesting fellow :). Five wives, wow! I had always heard the 4th wife was the keeper because you are too damn broke by then but apparently I was misled :)? Apologies to our women BCI friends for a possibly sexist joke! I am also with e-trade in my trading IRA. It was originally Options House so I am grandfathered at the $3.95 equity trade price. When Tastytrade/Tastyworks opened their brokerage with rock bottom options pricing I called e-trade, told them the other rates out there (which they had to already be aware of) and asked for better pricing which they gave me on the spot to keep my business. I wonder if the PMCC strategy has any real advantages? To me, it is only useful if I wish to trade CCs in a very high priced stock such as AMZN, GOOG, etc., where 100 shares would require an investment of more than $50,000.00, which is way above my possibilities. It looks like the PMCC adds more complications to the already difficult task of administrating a position, especially if you need to use the exit strategies when the trade goes against your initial assesment, or if the market goes down significantly. Please correct me if I am missing something here. You make excellent points here…there is much more to the PMCC than “covered call writing but cheaper” as it is defined in many venues. As I state multiple times in my book and DVDs about the PMCC, there are many moving parts that must be understood and mastered before implementing this strategy. The strategy, however, does have some advantages. For example, less capital is required to enter these trades because LEAPS options cost less than stocks and this concept applies to all stocks, not just the expensive ones. This means that the return on capital (ROO) will be higher as our cost-basis is lower. Disadvantages include a long-term commitment where our bullish assessment may change during the life of the long call, a lower pool of stocks that have LEAPS among others. 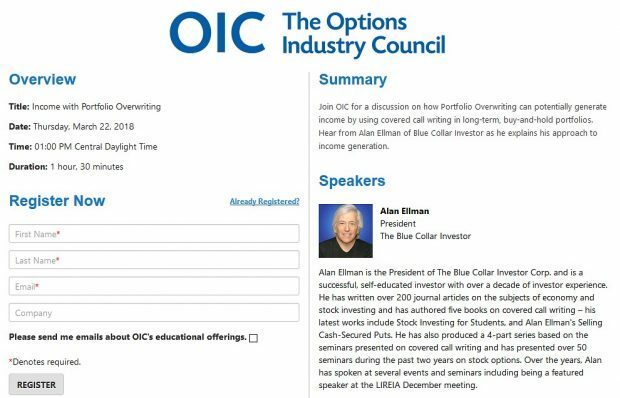 I use traditional covered call writing in my option-selling portfolios. However, we do have many members in our BCI community that either use or are interested in the PMCC and so that is why we included it in our latest book, “Covered Call Writing Alternative Strategies” and developed a PMCC Calculator, probably the most challenging calculator created by the BCI team (over 20 equations inherent in this calculator). For a full list of PMCC pros and cons, see pages 105 – 109 in the book I alluded to in this response. I understand the extra advantages, and will study the details and read the the book and the indicated pages very carefully. Your insights and explanations have always helped me, and I wish to learn always more. I use poor man’s covered calls a lot. I try to figure out when the report of earnings are likely to be as vega rises before earnings. If I still like the stock (very important) I roll during earnings week to a year later. Its IV is high and the IV of a year later relatively lower. Therefore I am selling an expensive opinion and buying a cheaper one. Some of my personal rules: Never ever when P/E of SPY is over 21 as a severe decline in the next six months is likely. A stock you can rise down, Not a poor man’s covered call. The chart must have a gradual rise. The Fair Value of the stock by discounted future cash flow must be greater than the present price. Thanks for sharing your always-interesting approach to option-selling. Rolling the long calls just prior to earnings and taking advantage of “horizontal volatility skew” is an interesting concept that makes sense. I like it. ← When Should We Execute Our Option-Selling Trades?